A Pinch of Salt, A Dash of Sass.Heirloom Archives - A Pinch of Salt, A Dash of Sass. 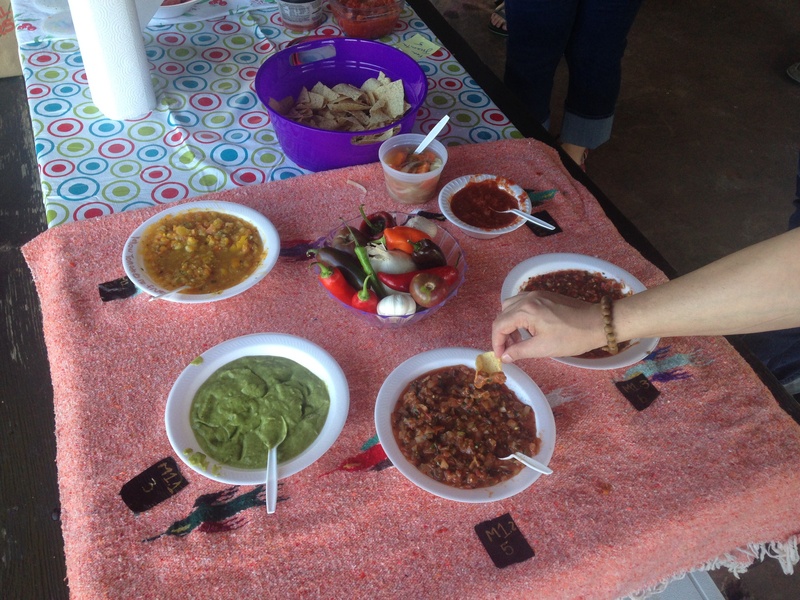 Salsapalooza 2014 — A Salsa Contest! Way back when I had some time to really get down to cooking, a friend of ours announced a salsa contest! About 40 folks got together, about 25 salsas, ranging in heat level from 1 to 10, sharing their favorite homemade salsas, conversation, and an absolutely beautiful day by the lake. I, meanwhile, because I am an overachiever and a little cray-cray, got all Martha Stewart up in hurr and had to make and enter five salsas. For the record, here’s what I entered — I can get the recipes together if anyone would like them! 1). Sunburst, made with ripe golden tomatoes, yellow sweet peppers, lemon drop hot peppers, garlic, cilantro, etc. 2) What John named “Green-go Sauce”, a salsa verde with some avocado added. 3) “Hot Mess,” a fire roasted salsa. The tomatoes, onions, garlic, and jalapeños were all charred and roasted under the broiler in the oven before assembling. 4) “Gratuitous Violet,” a fresh pico-style salsa made with Cherokee Purple heirloom tomatoes, sweet red peppers, spicy red Anaheim chiles, white onions, garlic and cilantro. and 5) “Lightning Sauce,” a cooked taco sauce-style entry made from heirloom tomatoes, a lightning pepper, garlic, onions, blended until smooth. To my surprise, in the mild-to-medium category, I won first AND second place! Bragging rights to be held over until Salsapalooza II, but I got a ton of complements on all five entries. I’ve never really won anything for my cookin’, so I am super way proud today. I am letting myself feel a little bit like a rock star! The voting was everyone at the picnic, so everyone brought salsa, tasted salsa, and then voted for your top two choices in each category. My purple pico and lightning sauce were 6-8 heat so were in the spicy category, and the other three were in mild. The green avocado sauce and the fire-roasted salsa swept the mild to medium category, a 3 and a 5 respectively. I voted for salsas that weren’t my own, because I genuinely appreciated their creativity and flavors. To come home from a friendly competition with other foodies and salsa lovers and to have the win is really an honor. I’m actually thinking of really entering some competitive cooking stuff. I need more hours in the day so I can fit in all the fun!! What’s your favorite salsa or dip? One of my favorite things to do in the Summer is explore farmers’ markets. I am originally from Arizona, which grows some produce here and there, but as Sam Kinnison said — it’s a desert. Nothing grows here. When I moved to Oklahoma, I was excited to discover that yes, Virginia, there ARE green fields that grow delicious juicy snappy fresh crisp fruits and veggies, and they could all be mine. MINE. When the weather starts to warm, I start stalking farmers’ markets waiting for opening dates and schedules and lists of who’s selling wares. I had to start getting picky, because some “markets” were a parking lot with a few card tables and folks selling crafts and Tupperware. Some had some actual local farmers with fresh veg, but they’d be next to someone who backed up a pickup truck full of cantaloupes from Texas or something equally not cool. Then, I discovered Brooks Farm Market in Oklahoma City, where the Oklahoma Farm Fresh Association members gather to sell fruits, veggies, meats, cheeses, jams, jellies, eggs, chickens, pasta — YEAR ROUND.